Praying mantises (Mantidae) and grasshoppers (Caelifera) are both noted for their impressive legs. These two insect species are not closely related, but have evolved independently to have some rather impressive leg adaptations. Grasshoppers are often preyed upon by praying mantises and it’s often a battle of the leg adaptations that decides whether the mantis eats or the grasshopper escapes. Both the grasshopper and the praying mantis fold their legs. This adaptation serves two very different purposes. For the grasshopper, folding the rear legs enables him to generate sufficient energy to jump three times his own body length. He does this without moving his legs, flexing the muscles while static. Once he’s generated enough energy, he’ll hop quickly to safety. The main use of this adaptation is to avoid being eaten. The praying mantis, on the other hand, folds his front legs. His reflexes are lightning quick, enabling him to strike his prey with his front legs. 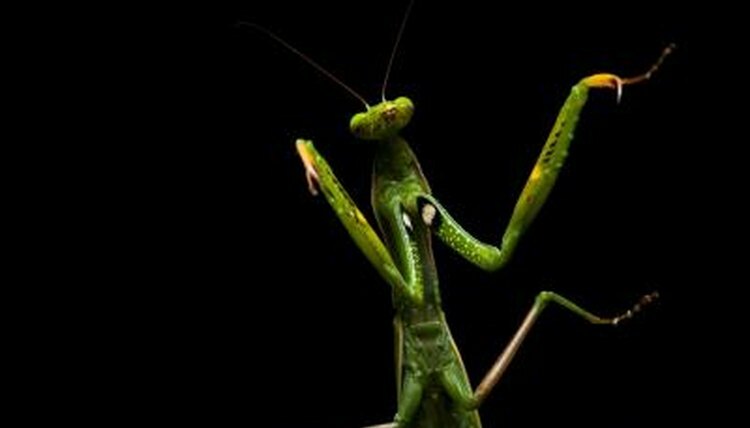 When folded, the front legs give the mantis the appearance of praying, hence the name. The praying mantis has one leg adaptation with which the grasshopper can’t compete, a spike. On the foreleg of the praying mantis is a small, hook-shaped spike that he uses for ensnaring his prey. Combined with the speed of his leg movement, the spike can be deadly. Even if it doesn’t kill the prey, the spike is typically sufficiently sharp to trap the prey. Grasshopper legs and praying mantis legs have one thing very much in common; they can generate startling degrees of power relative to their small body size. Were a human to generate the jumping power of the grasshopper, he or she would be capable of propelling themselves the length of three football pitches. Praying mantises display astonishing leg power too. One blow from the front leg of a praying mantis is capable of killing a prey insect. Without speed, the various adaptations of the grasshopper and the praying mantis would be pointless. In both insects, the speed they can generate is only brief. They are not capable of prolonged speed. The grasshopper’s speed comes from a build up of energy in his hind legs. The praying mantis gets his speed from his brain. His reflexes are considered to be twice as fast as that of the housefly. One thing grasshoppers can do with their legs that mantises can't, is generate sound. The male grasshoppers front legs are equipped with a row of peg-like appendages. When they rub their back legs against their wings, they create a distinctive call used to attract females. While both insects have adapted to become capable of brief bursts of power and strength, they are generally ungainly and slow creatures. When walking, the grasshopper is methodical. He plods along, his powerful hind legs more of a hindrance than a help. The praying mantis too, when not hunting, finds his enormous front legs keep him from making good progress.